Find a cosy spot in the house (or garden if warm enough!) and create a reading nook using some material and cushions. Climb inside and read, uninterrupted, for at least 15 minutes! My girls were SO excited about the idea of this and C. loved hunting around for a large piece of material with me. We found a sheet that we don’t use and a few drawing pins (thumb tacks) and some pegs. I attached the middle of the material over a corner of the room where our book baskets are, then pulled out the sides and draped those over heavy objects. 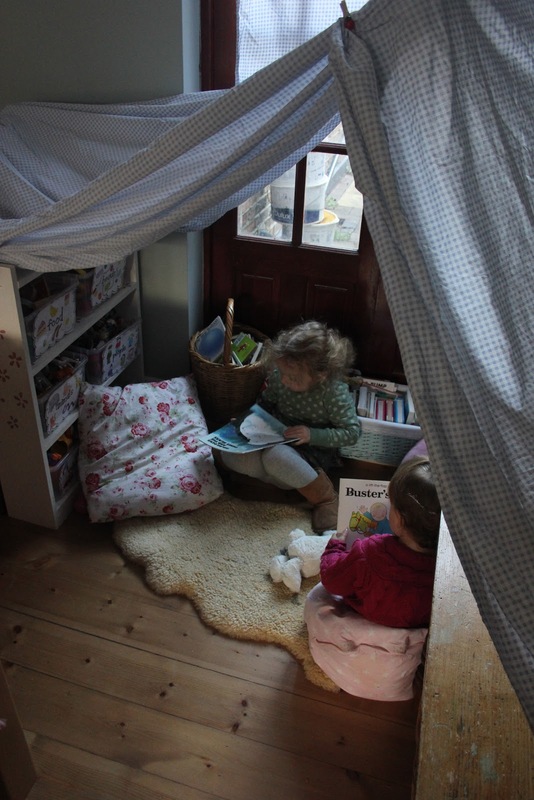 We took a sheepskin rug, some cushions and bean bags into the nook and straight away, both girls ran in and started pulling out the books into a pile for me to read! Pop contentedly “read” many to herself, babbling through the pages while I read the chosen pile to C. We stayed in there for a long time and have kept it up for now as a cosy place to come to throughout the day. 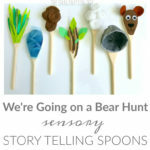 It could be a perfect place for storytelling with puppets and story props, listening to songs and stories on tape or brining favourite toys for a teddy bear’s picnic! Tomorrow hands on: as we grow will have the challenge for day 18! 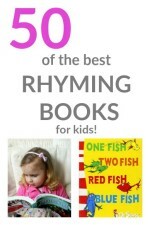 Today is also time to link up all posts related to play and creativity with children! This is a wonderful collection to the very best child focused activities from around the web and we are so pleased that you share your ideas with us all each week! Can’t wait to see what you will be bringing today. 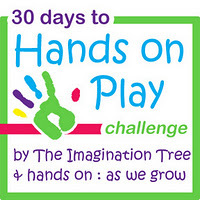 « 30 Days to Hands on Play Challenge: Playing with Junk! Ha ha…Fabulous tent! You rock! Can’t wait to do this later today! 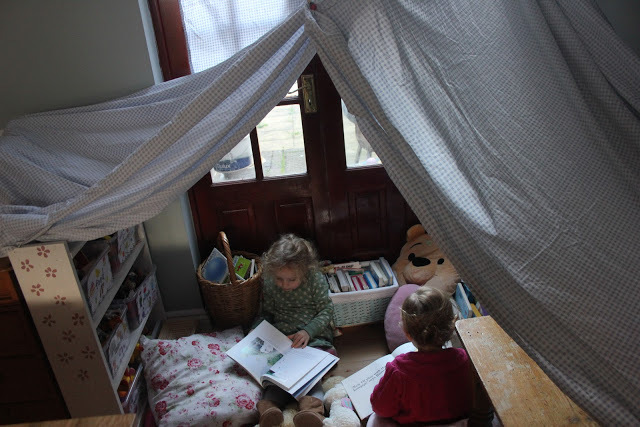 Ooh I like the reading tent idea!! How gorgeous is that KCC?!! the power of storytelling at its finest! Great idea. We built one into Henry’s room. I made him a loft bed last summer. Underneath is about four feet of clearance that I lined with rope lights. We covered the floor with form mats and tossed all the old trow pillows and stuffed animals underneath. Makes for a special place to curl up and read Harry Potter, and Encyclopedia Brown.